The Old Testament Tabernacle, with its various articles and the offering up of animal sacrifices, were insufficient in their attempt to commune with God and forgive sins. But these things now speak of Christ and helps us to commune with Him. In my last post on this subject we journeyed through the tabernacle and discussed the symbolic meaning of the gate, the bronze altar, and the laver. Now, in this post, we will go in our mind into the sanctuary—the Holy Place. To the left of us we see a shining golden lampstand with seven golden lamps, burning brightly and giving light to the whole room. To the right we see a dazzling golden table with twelve small loaves of bread on top. Directly ahead of us, in front of a beautiful veil is a small smoldering golden altar—about 3 ½ feet high and 20 inches square. As we look around at all these things, we are also keenly aware that there is a presence in the sanctuary—the High Priest. His duties were as follows: to trim the lamps and to keep them filled with oil, to keep fresh bread on the table (which was eaten only by himself and the other priests), and also to keep the incense (in the altar) burning continually before the Lord. Let us go now to each of these pieces of furniture and see what they represent for us. The Golden Candlestick. The Golden Candlestick with its seven golden lamps was typical of Christ and gave light to the Holy Place. “I am the light of the world,” Jesus said of Himself. “He who follows Me shall not walk in darkness, but have the light of life.” (Jn. 8:12) The Candlestick also gives us a picture of the union between Christ and the church, for as He is the light of the world, we, having His light in us are lights in the world. For this reason, He says to us, “Let your light so shine before men that they may see your good works and glorify your Father in heaven” (Matt. 5:16). So let us pause now and thank God for Jesus who is our light. His Word to us is a lamp unto our feet and a light to our path (Ps. 119:105). Let us also resolve to follow Him more closely, as to let our light shine more brightly in the dark world. The Table of Showbread. The Showbread is a type of Christ as the Bread of Life. Jesus said about Himself, “I am the bread of life. He who comes to me shall never hunger, and he who believes in Me shall never thirst” (Jn. 6:33-58). Here, the Showbread, which gave the priests physical strength, was and is symbolic of spiritual strength, which comes to us through Christ. At this point in our journey let us stop and thank God for Jesus, through whom we can do all things (Phil. 4:13), and by whom all our needs shall be supplied (Phil. 4:16). The Altar of Incense. 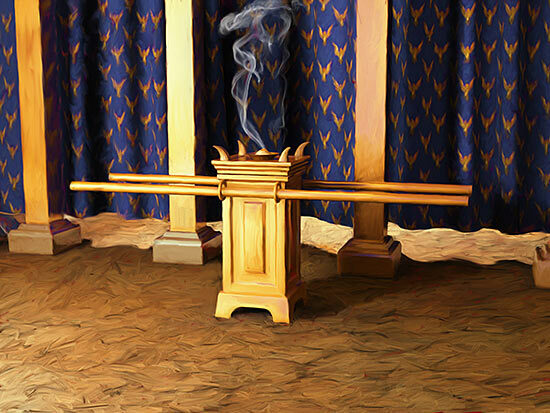 The Altar of Incense (pictured) was where incense was burnt. Twice a day, in the morning and in the evening, the High Priest took coals from the brazen altar and ignited the incense, for it was to be kept burning perpetually. The High Priest prefigured Christ; his ministry at the altar was a figure of Christ in heaven offering prayers to God (Christ offers to His Father both our prayers for ourselves and others, and His prayers for us). The incense, which was burned on the altar, is a representation of the true prayers of the saints. Our prayers, however, do not represent us, but the glory and work of Christ in us. He is the reason why our prayers are sweet like incense. As Paul wrote, “… we are to God the fragrance of Christ…” (2 Cor. 2:15). 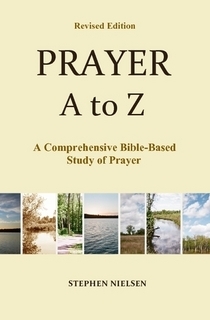 This entry was posted in Confidence in Prayer, Prayer A to Z Excerpts and tagged altar of incense, Golden altar of incense, golden candlestick, High Priest, incense, old testament tabernacle, prayer, table of showbread, types of Christ. Bookmark the permalink. An ecumenicist once said that all the religions of the world wear different clothing but are the same underneath — they “all” teach that God accepts you if you bring to Him a life of good works. How wrong! In Christianity, as taught by Scripture, God accepts you only if you bring your sins to Him, so that that can be taken care of by Christ’s substitutionary sacrifice — and we see that typified in the Tabernacle, where the reverent worshipper brings his sins to the Tabernacle (a type of Christ) to be purged by God’s ordained sacrificial system (which is a type of Christ). As we see in 1st Corinthians 15:3-4 the good news of Christianity is that Christ died for our sins “according to the Scripture” and He rose from the dead “according to the Scripture” — providing, by imputation, perfect righteousness to us (who believe in Christ as Savior) as a gracious GIFT (Eph. 2:8-9)! .